This book is a guide to importing virtual machines from foreign hypervisors to Red Hat Enterprise Virtualization and KVM managed by libvirt. The Red Hat Enterprise Linux 6 version of the virt-v2v utility has been deprecated. Users of Red Hat Enterprise Linux 6 are advised to create a Red Hat Enterprise 7 virtual machine, and install virt-v2v in that virtual machine. The Red Hat Enterprise Linux 7 version is fully supported and documented in virt-v2v Knowledgebase articles. V2V is an acronym for virtual to virtual, referring to the process of importing virtual machines from one virtualization platform to another. Red Hat Enterprise Virtualization and Red Hat Enterprise Linux are capable of performing V2V operations using the virt-v2v command. The virt-v2v command converts virtual machines from a foreign hypervisor to run on KVM, managed by Red Hat Enterprise Virtualization or libvirt. virt-v2v can currently convert virtual machines running Red Hat Enterprise Linux and Windows on Xen, KVM and VMware ESX / ESX(i) hypervisors. virt-v2v enables paravirtualized (virtio) drivers in the converted virtual machine if possible. All minor releases of the above guest operating systems are supported by virt-v2v. This guide describes how to import virtual machines from foreign hypervisors to Red Hat Enterprise Virtualization and KVM managed by libvirt. This guide is intended for system administrators who manage a virtualized environment using Red Hat Enterprise Virtualization or Red Hat Enterprise Linux. An advanced level of system administration, preferably including familiarity with virtual machine data center operations, is assumed. This document is not intended for beginners. The Red Hat Enterprise Virtualization platform is a richly featured virtualization management solution providing fully integrated management across virtual machines. It is based on the leading open source virtualization platform and provides superior technical capabilities. The platform offers scalability in the management of large numbers of virtual machines. Red Hat Enterprise Linux — Virtualization Getting Started Guide: This guide provides an introduction to virtualization concepts, advantages, and tools, and an overview of Red Hat virtualization documentation and products. Red Hat Enterprise Linux — Virtualization Host Configuration and Guest Installation Guide: This guide covers the installation of virtualization software and configuration of guest machines on a virtualization host. Red Hat Enterprise Linux — Virtualization Administration Guide: This guide covers administration of hosts, networking, storage, and device and guest management using either virt-manager or virsh as primary configuration tools. This guide also includes a libvirt and QEMU reference, as well as troubleshooting information. Red Hat Enterprise Linux — Virtualization Security Guide: This guide provides an overview of virtualization security technologies provided by Red Hat. Also included are recommendations for securing hosts, guests, and shared infrastructure and resources in virtualized environments. Red Hat Enterprise Linux — Virtualization Tuning and Optimization Guide: This guide provides tips, tricks and suggestions for making full use of virtualization performance features and options for your systems and guest virtual machines. Red Hat Enterprise Linux — V2V Guide: This guide describes importing virtual machines from KVM, Xen and VMware ESX/ESX(i) hypervisors to Red Hat Enterprise Virtualization and KVM managed by libvirt. The Red Hat Enterprise Virtualization documentation suite provides information on installation, development of applications, configuration and usage of the Red Hat Enterprise Virtualization platform and its related products. Red Hat Enterprise Virtualization — Installation Guide: This guide describes how to prepare for and set up a Red Hat Enterprise Virtualization environment, and how to upgrade a Red Hat Enterprise Virtualization environment to the latest release. It also outlines how to set up hypervisors and perform initial configuration of a Red Hat Enterprise Virtualization environment. Red Hat Enterprise Virtualization — Administration Guide: This guide describes how to configure and administer a Red Hat Enterprise Virtualization environment after that environment has been set up for the first time, including how to add hypervisors, storage domains, and external providers to the environment, how to manage resources such as virtual machines, virtual disks, and templates, and how to take and restore backups. Red Hat Enterprise Virtualization — User Guide: This guide describes how to use the User Portal of a Red Hat Enterprise Virtualization environment, including the functionality provided by the Basic and Extended tabs, how to create and work with virtual machines and templates, and how to monitor resource usage. Red Hat Enterprise Virtualization — Technical Guide: This guide describes how to use the REST API, the Python and Java software development kits, and command-line tools specific to Red Hat Enterprise Virtualization. It also outlines the underlying technical concepts behind Red Hat Enterprise Virtualization. Red Hat Enterprise Virtualization — Manager Release Notes: This guide contains information on the Red Hat Enterprise Virtualization Manager specific to the current release. Red Hat Enterprise Virtualization — Technical Notes: This guide describes the changes that have been made between the current release and the previous release. virt-v2v is run from a Red Hat Enterprise Linux 64-bit host system. virt-v2v must be installed on the host. virt-v2v is available on the Red Hat Customer Portal in the Red Hat Enterprise Linux Server (v.6 for 64-bit x86_64) or Red Hat Enterprise Linux Workstation (v.6 for x86_64) channel. Ensure the system is subscribed to the appropriate channel before installing virt-v2v. Red Hat Network Classic (RHN) has now been deprecated. Red Hat Subscription Manager should now be used for registration tasks. For more information, see https://access.redhat.com/rhn-to-rhsm. If you are converting Windows virtual machines, you must install the libguestfs-winsupport and virtio-win packages. These packages provide support for NTFS and Windows paravirtualized block and network drivers. If you attempt to convert a virtual machine using NTFS without the libguestfs-winsupport package installed, the conversion will fail. If you attempt to convert a virtual machine running Windows without the virtio-win package installed, the conversion will fail giving an error message concerning missing files. virt-v2v is now installed and ready to use on on your system. virt-v2v can convert virtual machines to run on Red Hat Enterprise Linux, using KVM managed by libvirt. Virtual machines can be converted from Xen, KVM, VMware ESX / ESX(i), and Hyper-V environments. The libvirt and virsh commands are documented in the Red Hat Enterprise Linux Virtualization Administration Guide. You may also use the command man virsh for more information. The virt-v2v command enables paravirtualized (virtio) drivers in the converted guest, if possible. virt-v2v is available on Red Hat Customer Portal in the Red Hat Enterprise Linux Server (v.6 for 64-bit x86_64) or Red Hat Enterprise Linux Workstation (v.6 for x86_64) channel. The virt-v2v tool requires root access to the host system. The -op and -osd command line options continue to be supported, but are deprecated in favor of -os. There is no deprecation warning when they are used. The -of command line option allows specification of the file format to be used for target storage: raw or qcow2. This feature allows for the conversion of a virtual machine with raw storage to qcow2 and vice versa. The -oa command line option allows the allocation policy of the target storage to be specified: sparse or preallocated. This can be used to convert between sparse and preallocated. Underlying this change, sparse volumes are now supported. The configuration file can now contain target profiles, which specify the storage location, output format and allocation policy for a target. This allows the user to specify --profile<foo> rather than -os<a> -op<b> -oa<oc>. The conversion of Windows virtual machines to libvirt targets is supported. Refer to the virt-v2v man page for further details on these and other features. virt-v2v converts virtual machines from a foreign hypervisor to run on Red Hat Enterprise Linux, using KVM managed by libvirt. It automatically creates a libvirt domain for the converted virtual machines. Before a virtual machine can be converted, ensure that the following steps are completed. Create a local storage domain for transferred storage. virt-v2v copies the guest virtual machine storage to a locally defined libvirt storage pool during import. This pool can be defined using any libvirt tool, and can be of any type. The simplest way to create a new pool is with virt-manager. Refer to the Red Hat Enterprise Linux Virtualization Administration Guide for complete instructions on creating storage pools with either virt-manager or virsh. The local machine must have an appropriate network to which the converted virtual machine can connect. This is likely to be a bridge interface. A bridge interface can be created using standard tools on the host. From libvirt version 0.8.3 and onward, virt-manager can also create and manage bridges. For more information on bridged networking with libvirt, see the Red Hat Enterprise Linux Virtualization Host Configuration and Guest Installation Guide or the Red Hat Enterprise Linux Virtualization Administration Guide. Specify network mappings in virt-v2v.conf. This step is optional, and is not required for most use cases. If your virtual machine has multiple network interfaces, /etc/virt-v2v.conf must be edited to specify the network mapping for all interfaces. You can specify an alternative virt-v2v.conf file with the -f parameter. If your virtual machine only has a single network interface, it is simpler to use the --network or --bridge parameters, rather than modifying virt-v2v.conf. Create a profile for the conversion in virt-v2v.conf. This step is optional. Profiles specify a conversion method, storage location, output format and allocation policy. When a profile is defined, it can be called using --profile rather than individually providing the -o, -os, -of and -oa parameters. See virt-v2v.conf(5) for details. Before a virtual machine running Linux can be converted, ensure that the following steps are completed. As part of the conversion process, virt-v2v may install a new kernel and drivers on the virtual machine. If the virtual machine being converted is registered to Red Hat Subscription Management (RHSM), the required packages will be automatically downloaded. For environments where Red Hat Subscription Management (RHSM) is not available, the virt-v2v.conf file references a list of RPMs used for this purpose. The RPMs relevant to your virtual machine must be downloaded manually from the Red Hat Customer Portal and made available in the directory specified by the path-root configuration element, which by default is /var/lib/virt-v2v/software/. virt-v2v will display an error similar to Example 3.1, “Missing Package error” if the software it depends upon for a particular conversion is not available. Log in to the Red Hat Customer Portal: https://access.redhat.com/. In the Red Hat Customer Portal, select Downloads > Product Downloads > Red Hat Enterprise Linux. A list of packages displays. Select the package name identical to the one in the error message. This opens the details page, which contains a detailed description of the package. Alternatively, to download the most recent version of a package, select Download Latest next to the desired package. Save the downloaded package to the appropriate directory in /var/lib/virt-v2v/software. For Red Hat Enterprise Linux 6, the directory is /var/lib/virt-v2v/software/rhel/6. The following is required when converting virtual machines on a host which used to run Xen, but has been updated to run KVM. It is not required when converting a Xen virtual machine imported directly from a running libvirt/Xen instance. Obtain the XML for the virtual machine. This will require booting into a Xen kernel to obtain the XML, as libvirt needs to connect to a running Xen hypervisor to obtain its metadata. The conversion process is optimized for KVM, so obtaining domain data while running a Xen kernel, then performing the conversion using a KVM kernel will be more efficient than running the conversion on a Xen kernel. virt-v2v does not support conversion of the Windows Recovery Console. If a virtual machine has a recovery console installed and VirtIO was enabled during conversion, attempting to boot the recovery console will result in a stop error. Windows XP x86 does not support the Windows Recovery Console on VirtIO systems, so there is no resolution to this. However, on Windows XP AMD64 and Windows 2003 (x86 and AMD64), the recovery console can be reinstalled after conversion. The re-installation procedure is the same as the initial installation procedure. It is not necessary to remove the recovery console first. Following re-installation, the recovery console will work as intended. Before a virtual machine running Windows can be converted, ensure that the following steps are completed. If you attempt to convert a virtual machine using NTFS without the libguestfs-winsupport package installed, the conversion will fail. An error message similar to Example 3.2, “Error message when converting a Windows virtual machine without libguestfs-winsupport installed” will be shown. No operating system could be detected inside this disk image. image, or because the OS type is not understood by virt-inspector. information about the disk image as possible. If you attempt to convert a virtual machine running Windows without the virtio-win package installed, the conversion will fail. An error message similar to Example 3.3, “Error message when converting a Windows virtual machine without virtio-win installed” will be shown. When virtual machines running Windows are converted for output to Red Hat Enterprise Virtualization, post-processing of the virtual machine image will be performed by the Red Hat Enterprise Virtualization Manager to install updated drivers. See Section 7.2.2, “Configuration changes for Windows virtual machines” for details of the process. This step will be omitted when virtual machines running Windows are converted for output to libvirt. Once you have prepared to convert the virtual machines, use virt-v2v to perform the actual conversions. This section provides the steps to convert the virtual machines, and the command syntax for virt-v2v. virt-v2v: win2k3r2-pv-32 configured with virtio drivers. The size of the disk to be copied is the major factor in determining conversion time. For a virtual machine on average hardware with a single disk of 20GB or less, a conversion usually takes less than 10 minutes. For a list of virt-v2v parameters, refer to Chapter 7, References. KVM virtual machines can be converted remotely using SSH. Ensure that the host running the virtual machine is accessible using SSH. Where vmhost.example.com is the host running the virtual machine, pool is the local storage pool to hold the image, bridge_name is the name of a local network bridge to connect the converted virtual machine's network to, and guest_name is the name of the Xen virtual machine. You may also use the --network parameter to connect to a locally managed network if your virtual machine only has a single network interface. If your virtual machine has multiple network interfaces, edit /etc/virt-v2v.conf to specify the network mapping for all interfaces. If your virtual machine is Red Hat Enterprise Linux 4 or Red Hat Enterprise Linux 5 and uses a kernel which does not support the KVM VirtIO drivers, virt-v2v will attempt to install a new kernel during the conversion process. You can avoid this requirement by updating the kernel to a recent version of Red Hat Enterprise Linux 6 which supports VirtIO prior to conversion. When converting from KVM, virt-v2v requires that the image of the source virtual machine exists within a storage pool. If the image is not currently in a storage pool, you must create one. Ensure that the guest virtual machine's XML is available locally, and that the storage referred to in the XML is available locally at the same paths. Where pool is the local storage pool to hold the image, bridge_name is the name of a local network bridge to connect the converted virtual machine's network to, and guest_name.xml is the path to the virtual machine's exported XML. If your virtual machine uses a Xen paravirtualized kernel (it would be called something like kernel-xen or kernel-xenU), virt-v2v will attempt to install a new kernel during the conversion process. You can avoid this requirement by installing a regular kernel, which will not reference a hypervisor in its name, alongside the Xen kernel prior to conversion. You should not make this newly installed kernel your default kernel, because Xen will not boot it. virt-v2v will make it the default during conversion. When converting from Xen, virt-v2v requires that the image of the source virtual machine exists in a storage pool. If the image is not currently in a storage pool, you must create one. Contact Red Hat Support for assistance creating an appropriate storage pool. Presently, there is a known issue with importing Citrix Xen virtual machines to run on KVM or Red Hat Enterprise Virtualization. For more information, see https://access.redhat.com/solutions/54076. Xen virtual machines can be converted remotely using SSH. Ensure that the host running the virtual machine is accessible via SSH. If your virtual machine uses a Xen paravirtualized kernel (it would be called something like kernel-xen or kernel-xenU) virt-v2v will attempt to install a new kernel during the conversion process. You can avoid this requirement by installing a regular kernel, which will not reference a hypervisor in its name, alongside the Xen kernel prior to conversion. You should not make this newly installed kernel your default kernel, because Xen will not boot it. virt-v2v will make it the default during conversion. When converting a Windows virtual machine from VMware ESX / ESX(i), ensure that VMware Tools is not installed on the virtual machine. The VMware Tools must be uninstalled prior to the conversion process. If a virtual machine is converted with the VMware Tools installed, it will not function correctly. Ensure that the virtual machine is stopped prior to running the v2v process. Where esx.example.com is the VMware ESX / ESX(i) server, pool is the local storage pool to hold the image, bridge_name is the name of a local network bridge to connect the converted virtual machine's network to, and guest_name is the name of the virtual machine. The .netrc file must have a permission mask of 0600 to be read correctly by virt-v2v. This example demonstrates converting a local (libvirt-managed) Xen virtual machine running Windows for output to Red Hat Enterprise Virtualization. Ensure that the virtual machine's XML is available locally, and that the storage referred to in the XML is available locally at the same paths. Where guest_name.xml is the path to the virtual machine's exported XML, and storage.example.com:/exportdomain is the export storage domain. On successful completion, virt-v2v will create a new libvirt domain for the converted virtual machine with the same name as the original virtual machine. It can be started as usual using libvirt tools, for example virt-manager. virt-v2v cannot currently reconfigure a virtual machine's network configuration. If the converted virtual machine is not connected to the same subnet as the source, the virtual machine's network configuration may have to be updated manually. virt-v2v can convert virtual machines to run on Red Hat Enterprise Virtualization. Virtual machines can be converted from Xen, KVM and VMware ESX / ESX(i) environments. Before converting virtual machines to run on Red Hat Enterprise Virtualization, you must attach an export storage domain to the Red Hat Enterprise Virtualization data center being used. Section 4.2, “Attaching an export storage domain” explains the process of attaching an export storage domain. For more information on export storage domains, see the Red Hat Enterprise Virtualization Administration Guide. It is important to note that when converting a guest virtual machine to run on Red Hat Enterprise Virtualization, not all combinations of storage format and allocation policy are supported. The supported combinations differ according to whether the Red Hat Enterprise Virtualization data center the guest will be imported into uses block (FC or iSCSI) or file (NFS) for its data storage domain. Note that virt-v2v writes to an export storage domain, and this is always required to be NFS. The important element for a successful virtual machine import into Red Hat Enterprise Virtualization is the type of the data domain. virt-v2v is unable to detect the data center type, so this check must be applied manually by the user. Data format and allocation policy of the virtual machine being converted by virt-v2v will be preserved unless the output data format and allocation policy are specified using the -of and -oa parameters respectively. To import virtual machines using sparse allocation into an FC or iSCSI data center, the storage format must be converted to qcow2. This is achieved by passing the parameters -of qcow2 -oa sparse to virt-v2v. Note that converting between raw and qcow2 formats is a resource intensive operation, and roughly doubles the length of time taken for the conversion process. Preallocated qcow2 storage is never supported in Red Hat Enterprise Virtualization, although virt-v2v is able to write it. Import to Red Hat Enterprise Virtualization will fail. Before converting virtual machines to run on Red Hat Enterprise Virtualization, you must attach an export storage domain to the Red Hat Enterprise Virtualization data center being used. An export storage domain can be attached to a data center to enable the import or export of virtual machines from one data center to another. An export storage domain can also be used to backup virtual machines and templates. At a given time, an export domain can only be attached to a single data center. Log in to the Red Hat Enterprise Virtualization Administration Portal. Click the Data Centers tab. Select the data center to which the export storage domain is to be attached. The details pane displays. Select the Storage tab. Click Attach Export to add the storage location where the images are stored. The Attach Export Domain dialog box displays if there are export domains available. Select the export domain from the list. Click the OK button. The new export storage domain displays on the Storage tab of the details pane with a status of Locked, followed by Inactive. Select the new export storage domain on the Storage tab of the details pane, and click the Activate button. The export domain will be activated in a few moments and display an Active status. virt-v2v converts virtual machines from a foreign hypervisor to run on Red Hat Enterprise Virtualization. It automatically packages the virtual machine images and metadata, then uploads them to a Red Hat Enterprise Virtualization export storage domain. For more information on export storage domains, see Section 4.2, “Attaching an export storage domain”. virt-v2v always makes a copy of storage before conversion. From the export storage domain, the virtual machine images can be imported into Red Hat Enterprise Virtualization using the Administration Portal. Create an NFS export domain. 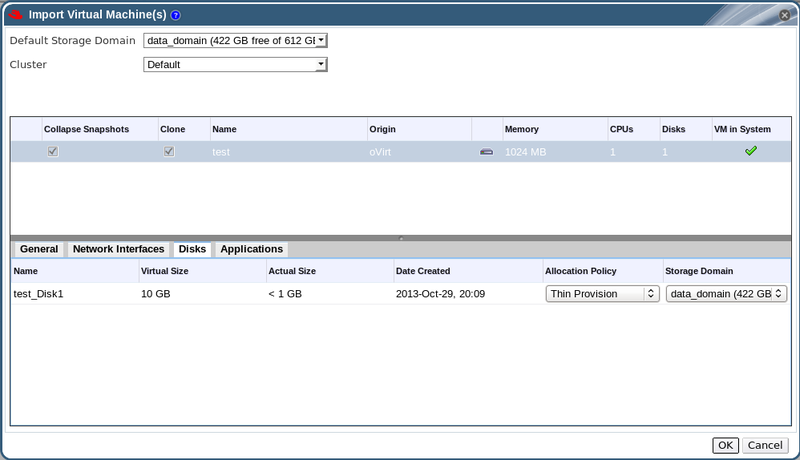 virt-v2v can transfer the converted virtual machine directly to an NFS export storage domain. From the export storage domain, the virtual machine can be imported into a Red Hat Enterprise Virtualization data center. The storage domain must be mountable by the machine running virt-v2v. When exporting to a Red Hat Enterprise Virtualization export domain, virt-v2v must run as root. The export storage domain is accessed as an NFS share. By default, Red Hat Enterprise Linux 6 uses NFSv4, which does not require further configuration. However, for NFSv2 and NFSv3 clients, the rpcbind and nfslock services must be running on the host used to run virt-v2v. The network must also be configured to allow NFS access to the storage server. For more details refer to the Red Hat Enterprise Linux Storage Administration Guide. If your virtual machine has multiple network interfaces, /etc/virt-v2v.conf must be edited to specify the network mapping for all interfaces. You can specify an alternative virt-v2v.conf file with the -f parameter. If you are converting to a virtual machine for output to both libvirt and Red Hat Enterprise Virtualization, separate virt-v2v.conf files should be used for each conversion. This is because a converted bridge will require different configuration depending on the output type (libvirt or Red Hat Enterprise Virtualization). Create a profile for the conversion in virt-v2v.conf. This step is optional. Profiles specify a conversion method, storage location, output format and allocation policy. When a profile is defined, it can be called using --profile rather than individually providing the -o, -os, -of and -oa parameters. See virt-v2v.conf(5) for details. The following is required when converting virtual machines which run Linux, regardless of which hypervisor they are being converted from. When converting a virtual machine running Windows with multiple drives, for output to Red Hat Enterprise Virtualization, it is possible in certain circumstances that additional drives will not be displayed by default. Red Hat Enterprise Virtualization will always add a CD-ROM device to a converted virtual machine. If the virtual machine did not have a CD-ROM device before conversion, the new CD-ROM device may be assigned a drive letter which clashes with an existing drive on the virtual machine. This will render the existing device inaccessible. The occluded disk device can still be accessed by manually assigning it a new drive letter. It is also possible to maintain previous drive letter assignment by manually changing the drive letter assigned to the new CD-ROM device, then rebooting the virtual machine. The following is required when converting virtual machines running Windows, regardless of which hypervisor they are being converted from. The conversion procedure depends on post-processing by the Red Hat Enterprise Virtualization Manager for completion. See Section 7.2.2, “Configuration changes for Windows virtual machines” for details of the process. Install the libguestfs-winsupport package on the host running virt-v2v. This may be because the file is not a disk image, or is not a virtual machine image, or because the OS type is not understood by virt-inspector. Install the virtio-win package on the host running virt-v2v. Upload the guest tools ISO to the ISO Storage Domain. Note that the guest tools ISO is not required for the conversion process to succeed. However, it is recommended for all Windows virtual machines running on Red Hat Enterprise Virtualization. The Red Hat Enterprise Virtualization Manager installs Red Hat's Windows drivers on the guest virtual machine using the guest tools ISO after the virtual machines have been converted. See Section 7.2.2, “Configuration changes for Windows virtual machines” for details. Locate the guest tools ISO. The guest tools ISO is distributed using the Red Hat Customer Portal as rhev-guest-tools-iso.rpm, an RPM file installed on the Red Hat Enterprise Virtualization Manager. After installing the Red Hat Enterprise Virtualization Manager, the guest tools ISO can be found at /usr/share/rhev-guest-tools-iso/rhev-tools-setup.iso. Upload the guest tools ISO. Upload the guest tools ISO to the ISO Storage Domain using the ISO uploader. Refer to the Red Hat Enterprise Virtualization Administration Guide for more information on uploading ISO files, and installing guest agents and drivers. A full specification of the parameters which can be used with virt-v2v is available in Section 7.1, “virt-v2v Parameters”. Presently, virt-v2v does not support converting a virtual machine with more than four IDE disks to Red Hat Enterprise Virtualization. Attempting to convert a virtual machine with five or more disks will fail. Ensure that the virtual machine's XML is available locally, and that the storage referred to in the XML is available locally at the same paths. Where storage.example.com:/exportdomain is the export storage domain, rhevm is the locally managed network to connect the converted virtual machine's network to, and guest_name.xml is the path to the virtual machine's exported xml. You may also use the --bridge parameter to connect to a locally managed network if your virtual machine only has a single network interface. If your virtual machine has multiple network interfaces, edit /etc/virt-v2v.conf to specify the network mapping for all interfaces. 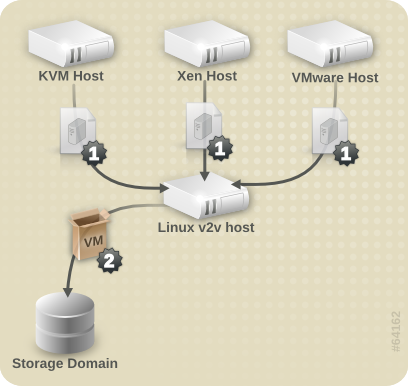 Where storage.example.com:/exportdomain is the export storage domain, rhevm is the locally managed network to connect the converted virtual machine's network to, and guest_name is the name of the Xen virtual machine. If your guest uses a Xen paravirtualized kernel (it would be called something like kernel-xen or kernel-xenU), virt-v2v will attempt to install a new kernel during the conversion process. You can avoid this requirement by installing a regular kernel, which will not reference a hypervisor in its name, alongside the Xen kernel prior to conversion. You should not make this newly installed kernel your default kernel, because Xen will not boot it. 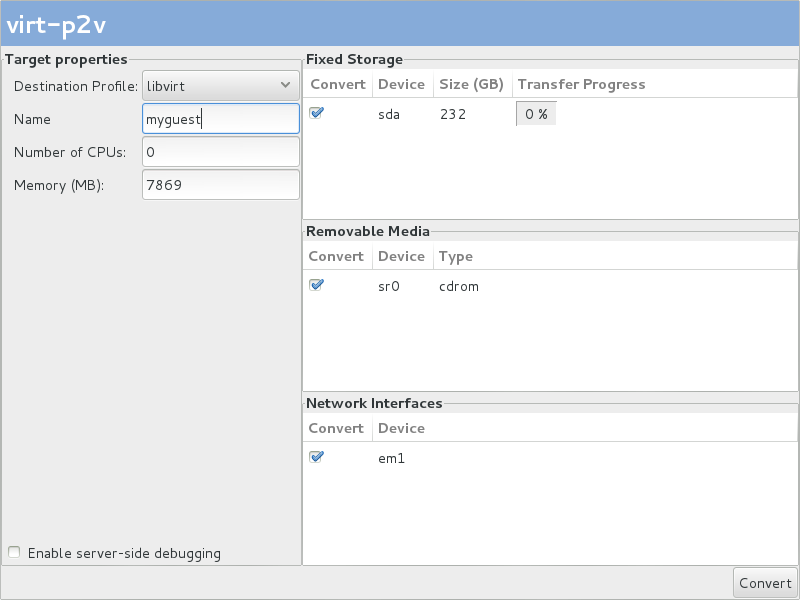 virt-v2v will make it the default during conversion. Xen virtual machines can be converted remotely using SSH. Ensure that the host running the virtual machine is accessible via SSH. Even on a guest with multiple disks, each virtual disk transfer requires a separate SSH session. It is recommended to set up SSH keys for authentication prior to the remote virtual machine conversion. Otherwise, a user will be required to manually enter SSH credentials for each guest disk being transferred. Failure to enter a password manually in the time after the transfer completes but before the SSH negotiation times out will cause virt-v2v to fail. This is especially important for large disks, as the disk transfer can take an unspecified length of time. Where vmhost.example.com is the host running the virtual machine, storage.example.com:/exportdomain is the export storage domain, rhevm is the locally managed network to connect the converted virtual machine's network to, and guest_name is the name of the Xen virtual machine. After stopping the virtual machine, run virsh define <path-to-guest.xml> to place the stopped virtual machine under the control of libvirt. This command allows virt-v2v to recognize the virtual machine and enable it to be converted. Where storage.example.com:/exportdomain is the export storage domain, rhevm is the locally managed network to connect the converted virtual machine's network to, and guest_name is the name of the KVM virtual machine. KVM virtual machines can be converted remotely via SSH. Ensure that the host running the virtual machine is accessible via SSH, and that the virtual machine is stopped prior to running the v2v process. Even on a guest with multiple disks, each virtual disk transfer requires a separate SSH session. Where kvmhost.example.com is the host running the virtual machine, storage.example.com:/exportdomain is the export storage domain, rhevm is the locally managed network to connect the converted virtual machine's network to, and guest_name is the name of the KVM virtual machine. Where storage.example.com:/exportdomain is the export storage domain, rhevm is the locally managed network to connect the converted virtual machine's network to, and guest_name is the name of the virtual machine. In the Red Hat Enterprise Virtualization Administration Portal, select the export domain from the Storage tab. The export domain must have a status of Active. Select the VM Import tab in the details pane to list the available virtual machines to import. Select one or more virtual machines and click Import. The Import Virtual Machine(s) window will open. 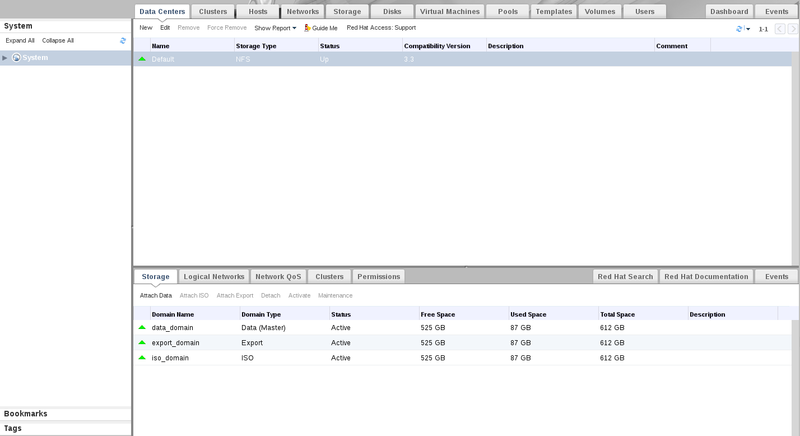 In the drop-down menus, select the select the Default Storage Domain, Cluster, and Cluster Quota in the data center. Select the Collapse Snapshots check box to remove snapshot restore points and include templates in template-based virtual machines. Click OK to import the virtual machines. For more information on importing virtual machines, refer to the Red Hat Enterprise Virtualization Administration Guide. virt-v2v cannot currently reconfigure a guest's network configuration. 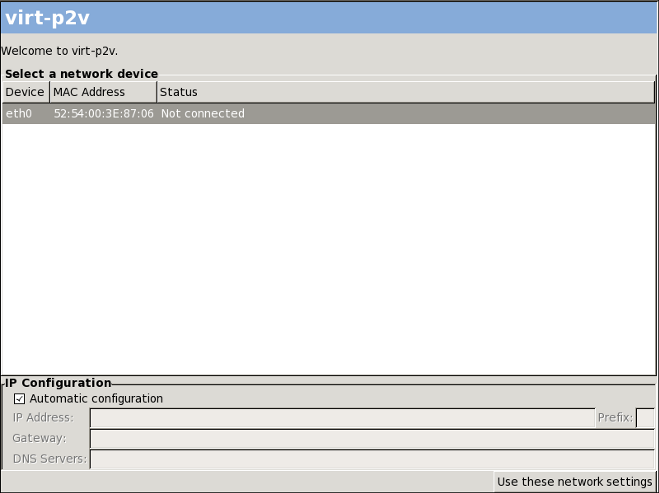 If the converted guest is not connected to the same subnet as the source, the guest's network configuration may have to be updated manually. The entire v2v process can be scripted, enabling the automated batch processing of a large number of virtual machines. The process is broken up into two steps, which must be run on separate hosts. 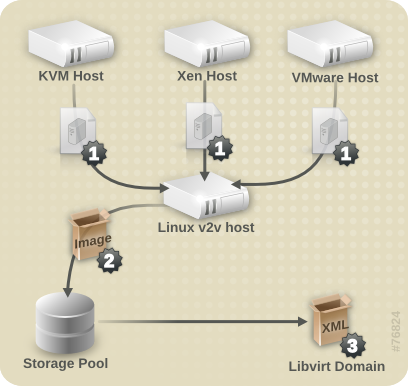 Use virt-v2v to convert the virtual machines and copy them to the export storage domain. This step must be run on a Linux host. The process is detailed in Section 4.3.2, “Converting a virtual machine”. Once the conversion is complete, use the Red Hat Enterprise Virtualization Administration Portal to import the virtual machines from the export storage domain. This step must be run on the Red Hat Enterprise Virtualization Manager server. For more information on importing a virtual machine with the Red Hat Enterprise Virtualization Administration Portal, see the Red Hat Enterprise Virtualization Administration Guide. When using the SDK method, entities can also be fetched and passed using name=. action vm "vm-to-import" import_vm --storagedomain-identifier "from-sd-id" --cluster-id "to-cluster-id" --storage_domain-id "to-sd-id"
When using the command line method, entities can also be fetched and passed using -name. For bulk import scenarios, it is advantageous to be able to perform the scripted v2v process from a single host. Remote procedure calls to the Red Hat Enterprise Virtualization Manager can be made using the REST API. This enables a single script running on a single Linux host to perform both steps of the v2v process. Figure 4.5, “Scripted bulk v2v process” illustrates the steps performed by the script. The virtual machine image is retrieved from the source hypervisor. The virtual machine image is packaged and copied to the export storage domain. A remote procedure call is made to the Red Hat Enterprise Virtualization Manager, telling it to import the virtual machine. The Manager imports the virtual machine from the export storage domain. Ensure the REST API is enabled on the Red Hat Enterprise Virtualization Manager, and it is accessible from the Linux host running the v2v process. For more information about the REST API, see the Red Hat Enterprise Virtualization REST API Guide Guide. On the Linux host, create the file v2v.sh with the following contents. Ensure you edit the script to contain appropriate values for your environment. Use the POST method to export virtual machines with the REST API. For more information about using the REST API, see the Red Hat Enterprise Virtualization REST API Guide. Run the v2v.sh script. It can take several hours to convert and import a large number of virtual machines. Read this chapter for information about converting physical machines to virtual machines with the Red Hat Physical-to-Virtual (P2V) solution, Virt P2V. Virt P2V is comprised of both virt-p2v-server, included in the virt-v2v package, and the P2V client, available from the Red Hat Customer Portal as rhel-6.x-p2v.iso. rhel-6.x-p2v.iso is a bootable disk image based on a customized Red Hat Enterprise Linux 6 image. Booting a machine from rhel-6.x-p2v.iso and connecting to a V2V conversion server that has virt-v2v installed allows data from the physical machine to be uploaded to the conversion server and converted for use with either Red Hat Enterprise Virtualization, or KVM managed by libvirt. Note that the host must be running Red Hat Enterprise Linux 6. Other host configurations will not work. The Physical to Virtual (P2V) feature requires a Red Hat Enterprise Linux 6 virtualization host with virt-v2v version 0.8.7 or later. You can check your version of virt-v2v by running $ rpm -q virt-v2v. Note that you cannot convert to a Red Hat Enterprise Linux 5 conversion server, or with a virt-v2v package previous to version 0.8.7-6.el6. A number of operating systems can be converted from physical machines to virtual machines, but be aware that there are known issues converting physical machines using software RAID. Red Hat Enterprise Linux 6 machines with a filesystem root on a software RAID md device may be converted to guest virtual machines. Red Hat Enterprise Linux 4 and Red Hat Enterprise Linux 5 physical machines with their filesystem root on a software RAID md device cannot be converted to virtual machines. There is currently no workaround available. Must be bootable from PXE, Optical Media (CD, DVD), or USB. Console access (keyboard, video, mouse). Before you use P2V, you must first prepare your conversion server and download and prepare the rhel-6.x-p2v.iso boot media. For full instructions see the Red Hat Enterprise Linux Installation Guide. Note that there is one ISO image for both i386 and x86_64 architectures. A conversion server is any physical server running Red Hat Enterprise Linux 6 or higher with the virt-v2v package installed on it. To install virt-v2v follow the instructions in Chapter 2, Installing virt-v2v. virt-v2v version 0.8.7-6 or higher is required. Now that virt-v2v is installed, the conversion server must be prepared to accept P2V client connections. The P2V client connects to the conversion server as root using SSH, so root login over SSH must be allowed on the conversion server. Add a line in the Authentication section of the file that says PermitRootLogin yes. This line may already exist and be commented out with a "#". In this case, remove the "#". Save the updated /etc/ssh/sshd_config file. You can now connect to the conversion server as root over SSH. P2V uses bootable media to create a bootable image of the hard drive of a physical machine and send it to the conversion server for import into a hypervisor. You will need a Red Hat subscription to download the rhel-6.x-p2v.iso ISO. Follow the instructions on preparing bootable media from the Red Hat Enterprise Linux Installation Guide. Note that there is only one ISO image for both i386 and x86_64 architectures. The latest release of rhel-6.x-p2v.iso can be found at https://rhn.redhat.com/rhn/channels/PackageList.do?filter_string=virt-p2v&cid=10508. The ISO file will be installed in /usr/share/virt-p2v/. The rhel-6.x-p2v.iso file can be used three ways: as a bootable disk, a PXE boot image, and as a bootable USB device. Burn the ISO to a blank CD-ROM or DVD-ROM, and insert it into the disk drive of the physical machine that is to be converted. To boot properly from this boot media, some changes to BIOS settings may be required to ensure that the optical disk drive is first in the boot order. Use the ISO to create a bootable USB media. To boot properly from this boot media, some changes to BIOS settings may be required to ensure that the USB device is first in the boot order. In addition, some BIOSes do not support booting from USB media. The P2V client disk image is approximately 100 MB, so the USB device must be large enough to hold the disk image. Prepare a PXE Boot image for your existing PXE server. To boot from PXE, some changes to BIOS settings may be required to ensure that the PXE boot is first in the boot order. More information about creating boot media can be found in Appendix A, Additional procedures. You have finished preparing and are now ready to move on to converting a physical machine to a virtual machine. By now you have prepared a conversion server and your chosen bootable media. 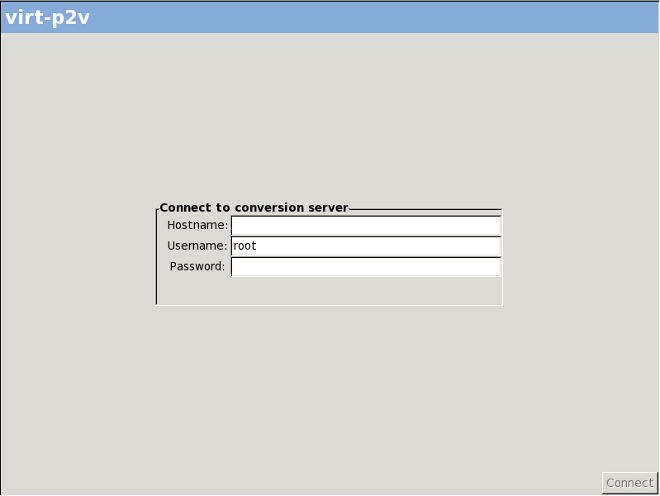 Next you will boot the P2V client, connect to your conversion server, and convert your physical machine. The conversion process can take a long time, especially when large physical disks are being converted. Boot the P2V client boot media on the conversion server. Boot the P2V client boot media on the conversion server that you created in preparation for your conversion. Because the P2V client is built on a Red Hat Enterprise Linux 6 live image, the Red Hat Enterprise Linux 6 splash image is displayed while the tool is booting. Generally, the P2V client configures networking automatically using DHCP. If it is unable to configure networking automatically, you will need to configure it manually. IP Address, Gateway, and Prefix are required fields. Enter values that are appropriate for your network, and click Use these network settings. Note, the P2V client does not support NIC teaming configurations for converting physical machines to virtual machines. To prevent automatic network configuration and configure your network manually, disconnect the physical machine from the network before booting. Connect to the conversion server. When networking is configured, you are prompted for connection details for the conversion server. These include Hostname (either host name or IP address), Username (this must be root), and Password. Enter these details and click Connect. Configure the target virtual machine and select hardware to convert. After connecting to your conversion server, configure the virtual hardware that will be attached to the converted physical machine, and select the physical hardware to be converted. Select a Destination Profile from the drop down menu. These reflect the target profiles included in the /etc/virt-v2v.conf file on the conversion server. Enter a Name in Target Properties for the virtual machine that will result from the conversion. The Number of CPUs and Memory(MB) in Target Properties are automatically detected and completed. Change these values if more CPUs or memory, or both, are desired on the outputted virtual machine. Under Fixed Storage, select one or more devices to convert. At least one Fixed Storage device must be converted, including the device containing the operating system installation. Under Removable Media, select one or more devices to convert. Under Network Interfaces, select one or more network interfaces to convert. Optional: If you wish to print debugging messages to a file, select the Enable server-side debugging check box. This instructs the server to write LIBGUESTFS_TRACE and LIBGUESTFS_DEBUG output during the conversion process. Note, the Enable server-side debugging check box is available only in Red Hat Enterprise Linux 6.5 and above. See Refer to Section 6.2, “Debugging P2V conversions” for more information on debugging P2V conversions. When the conversion is complete, a success message is displayed. You can shut down the physical machine. You have converted your physical machine into a virtual machine. You can now import and run it on a hypervisor. Now that you have converted your physical machine to a virtual machine, it can be run on a hypervisor. Problems encountered when attempting a V2V conversion can be more easily explained to engineers or support services if debugging messages are enabled when V2V is run. Exporting the debugging messages increases the verbosity of the V2V process, causing virt-v2v to print out messages as it runs. These messages will be displayed in the terminal from which virt-v2v is run. Instead, edit this command to export the debug messages to the virt-v2v.log file. To do this, prefix the above command with the environment variables LIBGUESTFS_TRACE=1 LIBGUESTFS_DEBUG=1, and redirect the output to the virt-v2v.log file by adding ... 2>&1 | tee virt-v2v.log to the end of the command. Problems encountered during P2V conversion can be more easily explained to engineers or support services if debugging messages are enabled when running virt-p2v. P2V debugging is available in Red Hat Enterprise Linux 6.5 and above. To enable P2V debugging, select the Enable server-side debugging check box on the convert screen in the virt-p2v client before clicking the Convert button. This instructs the server to write LIBGUESTFS_TRACE and LIBGUESTFS_DEBUG output during the virt-p2v conversion process. Refer to Chapter 5, Converting physical machines to virtual machines for instructions on using virt-p2v. Converting such a guest results in a failed conversion. There is no workaround for this issue. This chapter contains reference information for virt-v2v. Guest argument is the name of a libvirt domain. Guest argument is the path to an XML file containing a libvirt domain. Specifies the connection to use with the libvirt input method. If omitted, this defaults to qemu:///system. Note, this only works when virt-v2v is run as root. virt-v2v can currently automatically obtain guest storage from local libvirt connections, ESX / ESX(i) connections, and connections over SSH. Other types of connection are not supported. Create a libvirt guest. See the -oc and -os options. -os must be specified for the libvirt output method. Create a guest on a Red Hat Enterprise Virtualization export storage domain, which can later be imported using the Manager. The export storage domain must be specified using -os for the rhev output method. Specifies the libvirt connection to use to create the converted guest. If omitted, this defaults to qemu:///system if virt-v2v is run as root. 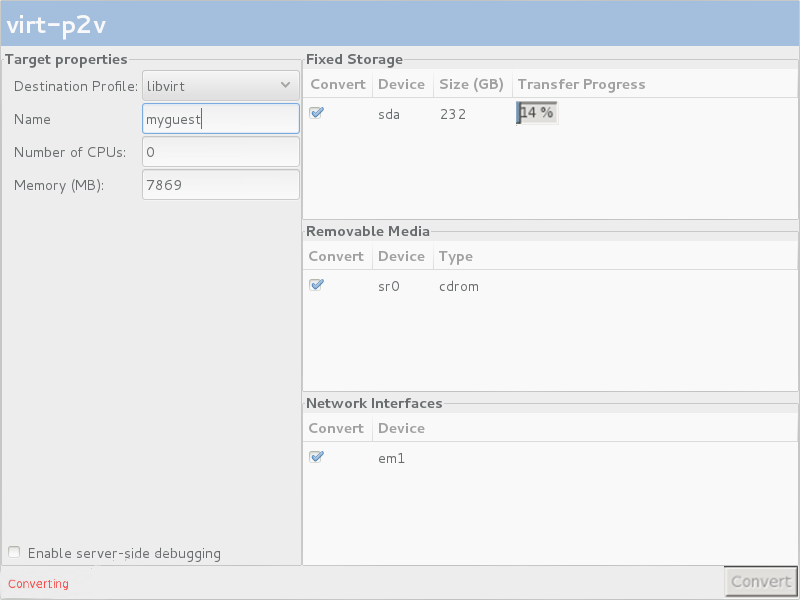 Note that virt-v2v must be able to write directly to storage described by this libvirt connection. This makes writing to a remote connection impractical at present. Specifies the location where new storage will be created for the converted guest. This is dependent on the output method, specified by the -o parameter. For the libvirt output method, this must be the name of a storage pool. For the rhev output method, this specifies the NFS path to a Red Hat Enterprise Virtualization export storage domain. Note that the storage domain must have been previously initialized by the Red Hat Enterprise Virtualization Manager. 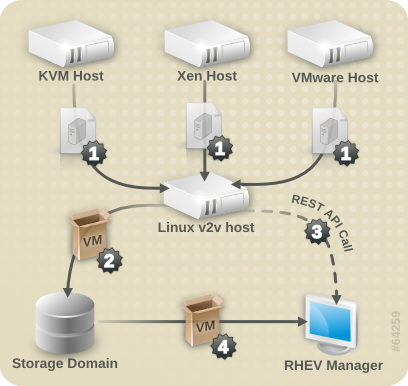 The domain must be in the format <host>:<path>, for example, rhev-storage.example.com:/rhev/export. The NFS export must be mountable and writable by the host running virt-v2v. This parameter is still supported, but is deprecated in favor of -os. Specifies the on-disk format which will be used for the converted guest. Currently supported options are raw and qcow2. The output format does not need to be the same as the source format - virt-v2v can convert from raw to qcow2 and vice versa. If not specified, the converted guest will use the same format as the source guest. Specifies whether the converted guest should use sparse or preallocated storage. The allocation scheme does not need to be the same as the source scheme: virt-v2v can convert from sparse to preallocated and vice versa. If not specified, the converted guest will use the same allocation scheme as the source. Renames the guest. If this option is not used, then the output name is the same as the input name. Load a virt-v2v configuration from file. Multiple configuration files can be specified; these will be searched in the order in which they are specified. If no configuration is specified, the defaults are /etc/virt-v2v.conf and /var/lib/virt-v2v/virt-v2v.db in that order. When overriding the default configuration details, we recommend also specifying /var/lib/virt-v2v/virt-v2v.db, as it contains default configuration data required for conversions. Map all guest bridges or networks which do not have a mapping in the configuration file to the specified network. This option cannot be used in conjunction with --bridge. Map all guest bridges or networks which do not have a mapping in the configuration file to the specified bridge. This option cannot be used in conjunction with --network. Use the default values for output method, output storage and network mappings from profile in the configuration file. In a multi-boot virtual machine, select the root file system to be converted. The default value for this option is --root=ask. When this option is selected, virt-v2v lists the possible root file systems and asks the user which file system should be used. In versions of Red Hat Enterprise Linux earlier than version 6.3, the default value was --root=single, which could cause virt-v2v to fail when a multi-boot virtual machine was detected. Selects the first root device if multiple devices are detected. Since this is a heuristic, the choice may not always be correct. Specifies that there is only one root device available to use. virt-v2v will fail if more than one device is detected. Specifies a particular root device to use, for example, --root=/dev/sda2 would specify the second partition on the first hard drive. If the specified device does not exist or was not detected as a root device, virt-v2v will fail. Display a list of target profile names specified in the configuration file. As well as configuring libvirt appropriately, virt-v2v will make certain changes to a virtual machine to enable it to run on a KVM hypervisor either with or without virtIO drivers. These changes are specific to the guest operating system. The details specified here apply to supported Red Hat Enterprise Linux versions and Windows. Kernel Unbootable kernels (such as Xen paravirtualized kernels) will be uninstalled. No new kernel will be installed if there is a remaining kernel which supports VirtIO. If no remaining kernel supports VirtIO and the configuration file specifies a new kernel it will be installed and configured as the default. X reconfiguration If the guest has X configured, its display driver will be updated. See Table 7.2, “Configured drivers in a Linux guest” for which driver will be used. Rename block devices If reconfiguration has caused block devices to change name, these changes will be reflected in /etc/fstab. Configure device drivers Whether VirtIO or non-VirtIO drivers are configured, virt-v2v will ensure that the correct network and block drivers are specified in the modprobe configuration. initrd virt-v2v will ensure that the initrd for the default kernel supports booting the root device, whether it is using VirtIO or not. SELinux virt-v2v will initiate a relabel of the guest on the next boot. This ensures that any changes it has made are correctly labeled according to the guest's local policy. Before converting Windows virtual machines, ensure that the libguestfs-winsupport and virtio-win packages are installed on the host running virt-v2v. These packages provide support for NTFS and Windows paravirtualized block and network drivers. If you attempt to convert a virtual machine using NTFS without the libguestfs-winsupport package installed, the conversion will fail. If you attempt to convert a virtual machine running Windows without the virtio-win package installed, the conversion will fail giving an error message concerning missing files. See Section 4.3.1.2, “Preparing to convert a virtual machine running Windows” for details. virt-v2v installs VirtIO block drivers. virt-v2v installs the CDUpgrader utility. virt-v2v copies VirtIO block and network drivers to %SystemRoot%\Drivers\VirtIO. The virtio-win package does not include network drivers for Windows 7 and Windows XP. For those operating systems, the rtl8139 network drivers are used. rtl8139 support must be already available in the guest virtual machine. virt-v2v adds %SystemRoot%\Drivers\VirtIO to DevicePath, meaning this directory is automatically searched for drivers when a new device is detected. virt-v2v makes registry changes to include the VirtIO block drivers in the CriticalDeviceDatabase section of the registry, and ensure the CDUpgrader service is started at the next boot. The virtual machine is imported and run on the Manager. See the Red Hat Enterprise Virtualization Administration Guide for details. The first boot stage can take several minutes to run, and must not be interrupted. It will run automatically without any administrator intervention other than starting the virtual machine. To ensure the process is not interrupted, no user should log in to the virtual machine until it has quiesced. You can check for this in the Manager GUI. If the guest tools ISO has been uploaded to the Manager, as detailed in Section 4.3.1.2, “Preparing to convert a virtual machine running Windows”, the Manager attaches the guest tools CD to the virtual machine. CDUpgrader detects the guest tools ISO and installs all the VirtIO drivers from it, including additional tools that are not included in virtio-win. The VirtIO drivers are reinstalled if the drivers in the guest tools ISO are newer than the ones previously installed from virtio-win. This ensures that the tools are kept up to date. The P2V Client can be booted from PXE boot, a bootable USB device, or optical media. Scripts for preparing boot options are included with the rhel-6.x-p2v.iso ISO in the LiveOS directory. The exact series of steps that produces a CD from an image file varies greatly from computer to computer, depending on the operating system and disc burning software installed. This procedure describes burning an ISO image to disk using Brasero which is included in Red Hat Enterprise Linux 6. Insert a blank, writable CD into your computer's CD or DVD burner. Open the Applications menu, choose the Sound and Video sub-menu, and click Brasero Disk Burner. Click the Burn Image button. Click the Click here to select a disc image button. Browse to the rhel-6.x-p2v.iso and select it for burning. Your BIOS may need to be changed to allow booting from your DVD/CD-ROM drive. Attach your USB device to the computer. For the livecd-iso-to-disk script to function, the USB filesystem must be formatted vfat, ext or btrfs. When the script finishes successfully, eject the USB device. When the command successfully completes, there is a tftpboot directory in the directory from which the command was run. Set up your DHCP, TFTP and PXE server to serve /tftpboot/p2vboot/pxeboot.0 . The initrd image contains the whole CD ISO. You will notice when pxebooting that initrd can take a long time to download. This is normal behavior. Version for 6.7 GA release.